Alexander Lorenz was born in 1961, still alive. He lived and worked in Vienna (Austria) as a designer, musician & artist 1986. He completed his first furniture concept, design and built the very... Read more first chair. 1987 – 2006. He runs a workshop for interior design & designing and manufacturing. "To design and re-invent the same things again and again signifies the possibility to keep on extracting new aspects from life and the illusion to be able to manipulate it. The form of an object expresses a certain mood, a certain feeling, a certain way of life into which a designer betakes himself for a short time, the next moment finding himself back again in normal life - possibly a little bit changed. Because the volatility of each condition manifests itself in the variety of its appearances, discovering new and unknown appearances is the great adventure of designing. Therefore, the style of a designer may not be what he has discovered but the manner how he tries to discover. To me the chance to be able to understand and to perhaps indeed interfere creatively beyond the specific purpose is the most beautiful and exciting aspect of design." 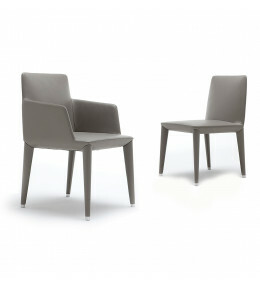 Bella Chairs make ideal dining or breakout seating and can be specified with or without arms.